The structure known since the early nineteenth century as Brearley Hall is in fact the younger of the two, having absorbed both the title and legend of the elder via custom and practice. This may be a chance legacy of its most recent famous resident, Dr John Fawcett, and the power of advertising in the form of the surviving notices for his 1776 Academy, which trained young men for the Particular Baptist Ministry. 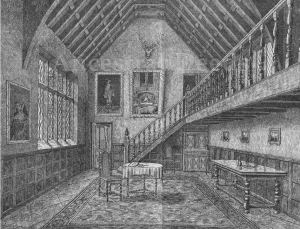 After the Brearley Estate was sold to the Rochdale Canal Company in 1795, Dr Fawcett moved his school to Ewood Hall, where it continued until 1835, compounding the capacity for future confusion, since the original, latterly known as Brearley Old Hall, was built c.1600 by the then owners of Ewood. Loidis and Elmete describes Lower Brearley as the site of a farmhouse at the bottom of a hill, near the fifth milestone from Halifax. Subsequent writers ignored the distinction, confusing the two buildings and ascribing the ancient pedigree to the wrong site – a misattribution that largely persists today. 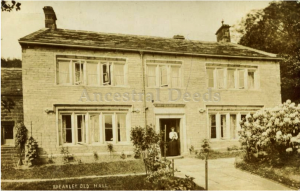 Even the excellent Brearley Old Hall, Brearley in the parish of Midgley webpage, which recognises the existence of two halls, conflates their residents: “In the early 1800’s ‘Upper Brearley Hall’ (erected 1621) was used as a private school run by a Dr. John Fawcett (d. 1817 at Ewood Hall). Later in 1841 Branwell Bronte, the brother to the Bronte sisters of Haworth lodged here at Brearley Hall”, citing Dr Juliet Barker’s family biography The Brontës and the 1841 census as its sources, though the conflation is its own. Old Brearley Hall still retains its original stone-mullioned windows and huge oak beams, as well as a decorated lintel bearing the inscription TSW 1638 (for Timothy and Sarah Wadsworth, to whom John Farrar’s son and daughter-in-law, William and Frances Farrar of Ewood, leased Brearley Milne in 1656) and a keystone carved with the date 1678, commemorating later alterations. Historic England has granted Brearley Old Hall Grade II listed status; its website dates rebuilding of the front façade to the late 19th century, while ascribing its original construction to the Wadsworths in 1636. One of the strongest arguments in the case for Old Brearley being the Hall in which Patrick Branwell Brontë lodged is its consistently documented life as a farm – his landlord James Clayton’s occupation having been recorded as Farmer in 1841. 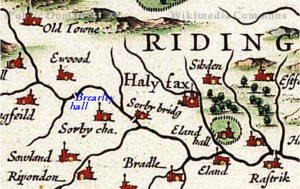 Sutcliffe references S. R. Clarke’s 1822 Yorkshire Gazeteer, which places the ancient Mansion of Brearley Hall in a low situation, originally the seat of the Lacies, now a farmhouse [my bold italics] – not to be confused with the house now called Brearley Hall on the summit of the hill. Upper Brearley may have usurped the title of Brearley Hall on most official documents by 1841, but Lower/Old Brearley was still referred to by its original moniker within the local community through the mid-19th century. Its size and situation appear well suited to a tenant farmer and his extended adult family, who may have been well-off financially as Dr Barker suggests, but clearly still welcomed the supplementary income generated by a single lodger, coincidentally the son of a respected successor to Revd. 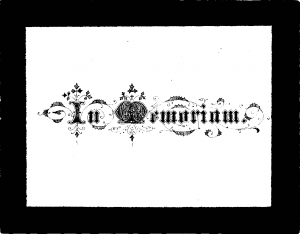 William Grimshaw, who himself lay buried in the Church of St Mary the Virgin in nearby Luddenden village, in whose grounds so many of my ancestors were interred from the late 17th century until they were closed for burial by Act of Parliament in 1853.